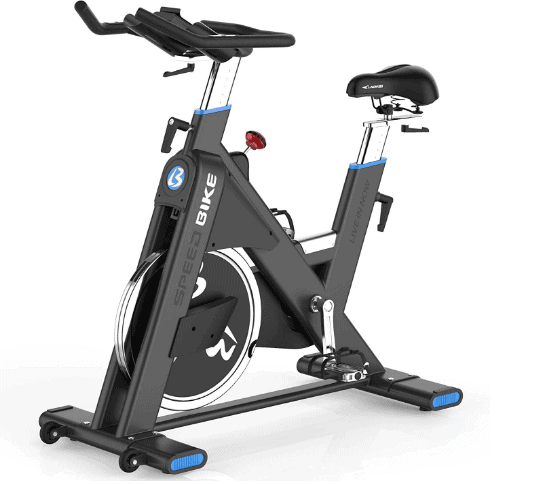 The L Now Indoor Cycling Bike LD-577 has similarities with the Spinner Blade ION Indoor Cycling Bike by Star Trac, except of course that the former is a belt driven bike whiles the latter is a chain driven bike. They both have commercial construction, which means they could withstand hard or prolong usage without falling apart. The L Now Indoor Cycling Bike LD-577 was built on high quality that is way better than the regular household indoor spinning bikes. Its frame is thick and made of steel and supports about 350 pounds/158.7 kg maximum user weight capacity. It is indeed a commercial cruiser that could also be used at home. The bike features outstanding 1.14 inches wide, 44 pounds/20 kg perimeter weight flywheel and has an overall weight of 134.5 pounds/61 kg. This advantageously boosts the overall stability of the bike and grounds it to provide safety and a comfortable ride. Now, you might think that it could be very difficult to move from one room to another. Not quite so, because it is integrated with transport wheels that make it a lot easier to tilt and roll away from one workout area to the storage area. It has a micro-adjustability that makes it possible for users of different heights to use it comfortably. Being a belt driven bike, its operation is quiet and smooth and it is almost maintenance free. The weight of the flywheel and the friction resistance system it features make it possible for a user to experience extremely challenging workouts and at the same time, it is suitable for everyone at any fitness level. Click right here if you wish to have a peek at the discounted price of the L Now Indoor Cycling Bike LD-577 on Amazon. The frame and the construction of the L Now Indoor Cycling Bike LD-577 are sturdy. Its frame is made up of thick and high-quality steel that is regarded as commercial grade. This machine could be utilized in the premises of a gym studio because it can withstand frequent usage. The frame is sprayed with anti-rust and scratch paint that preserves it and crank-arms, the seat and the handlebar posts are chrome finished. It possesses a heavy duty 1.14 inches wide, 44 pounds/20 kg flywheel that provides consistent momentum for an enjoyable ride. Evidently, the high user capacity of 350 pounds/157.6 kg that it supports is a testament of its sturdiness. The bike’s stability is well established because of the front and the rear flat oval steel bars that also have adjustable rubber levelers underneath them which enable the user to level up the bike on a surface that is not even. Moreover, its overall weight is partly the reason why this bike doesn’t wobble or move even during an intense workout; it has a weight of 134.5 pounds/61 kg. Do not be troubled that the weight might be a problem when you wish to move the bike from one room to another because it is incorporated with transport wheels at the front base which make relocation pretty easy. It is not a foldable bike neither does it have a size that is considered very large. Its assembled dimensions are 46 inches long by 21 inches wide by 52 inches tall. In other words, its workout area would be 3’8’’ long by 1’8’’ wide and a ceiling height of at least 7 feet tall will suffice. However, also consider adding extra clearance of 1’ to 2’ at the rear and on each side of the bike for safety and convenience purposes. Finally, a protective rubber mat is also included in the package so that the bike can be placed on it in order to prevent perspiration from spilling on the floor. The seat on the L Now Indoor Cycling Bike LD-577 is ergonomically designed with a hollow in the middle of it in order to provide good air permeability and heat dissipation. It is large, padded, and contoured to provide comfort for a long ride. Most spin bike’s seats are not comfortable but the one on this bike is different and users have not lamented about it. The seat is 4-way adjustable; that is, it could be adjusted vertically (upward/downward) and horizontally (fore/aft). It has several adjustment positions that could accommodate users of different heights comfortably. Users between 5’-6’8’’ tall could be accommodated depending on the inseam height of individuals. Therefore, it is important to measure your inner top thigh to the ankle and see if it is between 25’’-42.5’’ because those are the minimum and maximum inseam the bike supports. This also means that multiple users in the family can use the bike in turn and won’t have an issue finding their seat settings when altered because there are distinct markings on the post that remind you of them. The handlebar is also 4-way adjustable; something that is not common with most regular indoor stationary bikes. This compliments the seat’s adjustability and gives the user ample opportunity to find a suitable position for a comfortable workout. The handlebar also features a multi-grip design that provides different grips for different postures. It is coated with a soft rubber foam material that offers a secure and comfortable grip that allows the user to workout longer without experiencing blisters in the palms. Also, EKG sensors are embedded in the handlebar for the transmission of the pulse data to the monitor when they are gripped during a workout. This allows the user to keep track of and maintain the target heart rate zone at all times. The adjustments of the seat and the handlebar are very easy and could be done within seconds. The pedals feature toe cages and solid crank arms that could support stand up pedaling of a user weight (350 pounds/158.7 kg) the bike supports. The pedals accommodate only standard gym shoes but they could easily be swapped with SPD clips if you wish to use spin shoes, their threads are standard. The L Now Indoor Cycling Bike LD-577 is belt driven. Its operation is very quiet and smooth and doesn’t require any periodic lubrication or adjustment as a bike with a chain drive system would. This means no distracting noise while working out and the family or the neighbors won’t feel disturbed either. You could watch your favorite TV show or listen to good music without having to turn up the volume so high. The belt might get used up at some point in time but the manufacturer sends a new one once it is brought to their attention. The drive system consists of solid and quality elements such as the belt, crankset, the crank arms, the pulleys, and of course the 1.14 inches wide, 44 pounds/20 kg precision balanced flywheel. Due to the fact that the flywheel is fixed, one could pedal in reverse, having the opportunity to exercise more muscle groups. However, the user cannot coast as one could on a road bicycle. 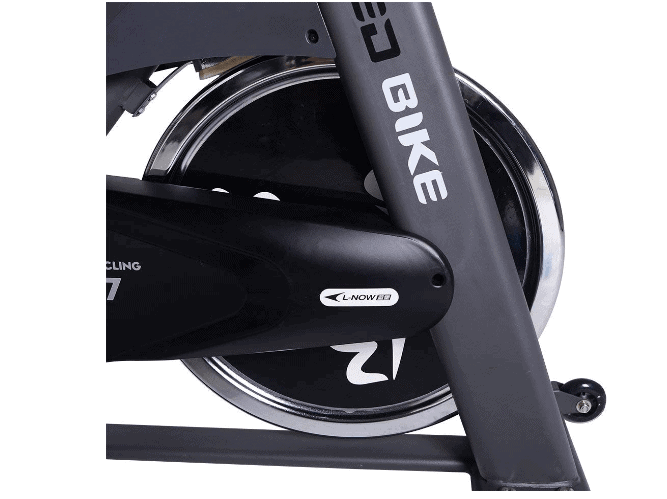 The L Now Indoor Cycling Bike LD-577 has a friction resistance system. It comprises of a top-down wool brake pad, tension knob and the flywheel. The resistance provides a different level of workout challenges that are suitable for users at different fitness levels. This means that beginners, intermediaries, folks undergoing physiotherapy and those that wish to encounter extremely challenging workouts will appreciate the resistance on this bike. Being that the felt brake pad is made of wool, it doesn’t wear out quickly and produces dust or make an annoying squealing sound when it is in contact with the flywheel. When the wool felt pad wears out just notify the manufacturer/seller and a new one will be sent to you. It is very easy to adjust the resistance strength. This is done via the red tension knob on the mainframe; twist it clockwise to increase the resistance level and turn anticlockwise to reduce it. Press it down to apply the emergency brake when you wish to stop pedaling. That said, it does not have pre-specified resistance levels on the tension knob. In other words, it has an infinite resistance level. You simply turn the tension knob until you feel you have got the right resistance strength suitable for you. The down side is that you may not be able to know when you have progressed into using higher resistance level in your subsequent workout sessions which makes it very difficult for you to keep track of your strength and endurance improvement. There are spin bikes that have pre-defined resistance levels. You may checkout Keiser indoor cycling bike or the ASUNA Lancer if it is really important to you. The console that is featured on the L Now Indoor Cycling Bike LD-577 is mid-range because it has a 3.5 inches monitor that could display the entire workout data at a time without having the need on your own part to scan through them. The display has good readability and it is powered by a cell battery CR2032 which is not included in the package, it has to be purchased separately by you. The LCD monitor keep track of time, speed, RTM, distance, calories burned, odometer, and the pulse. The pulse reads when you grip the EKG sensors on t he handlebar during a workout otherwise it won’t and the console is not telemetry enabled either. The console gives you the opportunity to set up goal target for time, distance, and calories burned. This motivates you and gives a sense of accomplishment when you are able to reach your target goal. The bike has water bottle holders which enable you to keep water and beverage within reach during a workout session so that you can stay hydrated. However, It doesn’t have tablet holder for the placement of a tablet device for entertainment but you can purchase an add-on that could be attached to the bike. The L Now Indoor Cycling Bike LD-577 is not very large; therefore storage of it is pretty convenient. Its overall assembled dimensions of 46 inches long by 21 inches wide by 52 inches tall won’t take up much space. Also, even though it weighs about 134.5 pounds/61 kg it could easily be moved away by tilting it toward the transport wheels at the front base. It could be stored under the staircase or just next to a wall. The L Now Indoor Cycling Bike LD-577 has received a good number of positive Amazon customers’ reviews. These are customers and users that were impressed by the overall quality and performance of the spinning bike. Thus, its average approval rating on Amazon at the time of this review is recommending and positive. The L Now Indoor Cycling Bike LD-577 comes in a box with dimensions of 43 inches by 37 inches by 10 inches. Amazon ships this machine without the extra shipping cost and delivers in time; however, other sellers may charge for shipping. The assembling of this bike is not very difficult as it is delivered with the major components preassembled. The assembly should take less than an hour, the tools required for the assembly and the instruction manual that guides you through the process are included in the package. Nevertheless, you may opt to use the ‘’expert assembly’’ service on Amazon if you wish not to do the assembling yourself but this comes with an extra charge. The bike does not need any major maintenance since it is a belt driven bike. No lubrication or adjustments is required. You simply need to always examine the bike before use for any loose or broken part that may need to be repaired or replaced. This prevents an accident and further damage to the bike. Finally, ensure to keep it clean from dirt and sweat before and after use. The L Now Indoor Cycling Bike LD-577 is a home-use commercial grade indoor cycling bike that provides you the gym spinning experience in your home. Its quality, stability and other features guarantee a safe, productive and enjoyable workout sessions at all times.